The suite of these “two-in-one” projects denotes a symbiosis between the ITEA 2 project SAFE and the Eureka Eurostars project SAFE-E. They fully complement each other, thus the results fit into the two work programs like a jig-saw piece into the resulting picture. The four SAFE-E partners – TTTech Computertechnik AG (Austria) as a SAFE-E coordinator, AVL Regensburg (Germany), fortiss (Germany) and Infineon Technologies AG (Germany) – deliver all their results to the larger ITEA 2 SAFE project coordinated by Continental Automotive GmbH. All four Eurostars SAFE-E project partners are also ITEA 2 SAFE project partners. The Eurostars project SAFE-E is only used as a funding instrument in order to enable ITEA 2 project funding in Austria. Both projects initially are 36 months EC and nationally funded projects (Bundesministerium für Bildung und Forschung in Germany and Forschungsförderungsgesellschaft m.b.H. in Austria). Both projects were extended to last until end of 2014. SAFE has been kicked off in July 2011 and SAFE-E started in September 2011. SAFE-E has a budget of 2.875 million Euro available. Detailed information may also be derived from the homepage (SAFE-E is placed on the same homepage as SAFE under the rider “Affiliated Projects”). The results of the SAFE-E project contribute to managing the complexity in safety-relevant embedded systems for automotive and industrial use. TTTech in particular contributes to SAFE-E goals by providing a software layer allowing the use of AUTOSAR basic software components even in up to ASIL D level, highly safety-relevant applications. The TTTech contributions support application developers to re-use existing and proven in the field, non-safety-relevant software building blocks in highly safety-relevant, up to ASIL D-compliant applications, reducing development time and cost as well as the risk due to reusing proven software elements. Furthermore, TTTech investigates advantages and disadvantages when using multicore ECUs versus single core ECUs. A video, showing how their results were applied in a demonstrator motor test stand for e-vehicles, provides evidence of the function and innovation of the software safety layer integrated in the motor control and the safety ECU developed. In addition, SAFE-E partners provide suitable abstraction and models (safety goals-, safety case- and architecture modelling, meta models, micro-controller models, model-based fault injection) also allowing for early validation of key properties. SAFE-E targets for new tools and integrating existing ones for designing project goal appropriate applications. 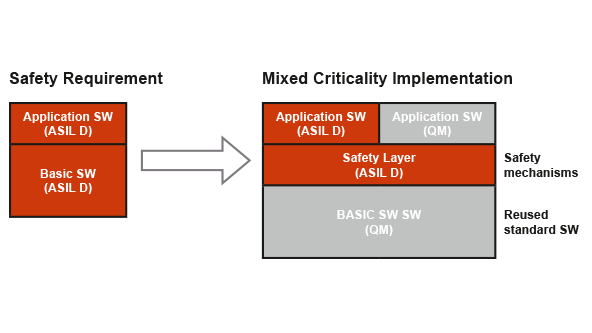 SAFE-E looks for means of automatic code generation including safety functionality according to ISO 26262 as well as for extending meta models for variant management and, in addition, for multi-criteria design space exploration. The results further aim at broadening the functionality in modern vehicles w.r.t. safety-relevant applications (i.e. electronic breaks, electronic gear boxes, steering, drive train for e-vehicles, motor control for e-vehicles). The project also aims at compiling appropriate training material supporting immediate pick-up in the automotive industry. Safe-E has received funding from the EUROSTARS programme under grant agreement n° 6095 and from the Austrian Ministry for Transport, Innovation and Technology under the funding programme “EUROSTARS”, grant agreement n° 832456 (Austrian Partner) and from the German Bundesministerium für Bildung und Forschung (German Partners).